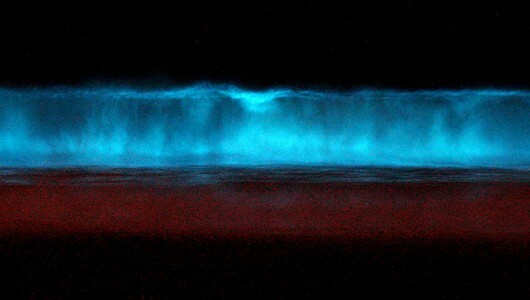 It looks like something from the movie “Avatar”: ocean waters that light up like neon glow sticks when they splash. Beaches across southern California have recently been alight with these freaky eerie, glowing waves. This beautiful, strange, otherworldly phenomenon is caused by bioluminescent phytoplankton called Lingulodinium polyedrum. This massive red tide, or algae bloom of microorganisms emit light in response to stress, such as when a wave crashes into the shore, a surfboard slashes through the surf, or a kayaker’s paddle splashes the water. The result is a wickedly cool glowing ocean. The phenomenon has been observed on a semi-regular basis since at least 1901 along the beaches around San Diego, Calif. By day the algal blooms give the water a soupy red coloration, which is why they’re often referred to as a red tide. But unlike some forms of red tide that can be toxic to people and marine life, the glowing blooms occurring in San Diego waters are reportedly harmless. For surfers who don’t mind catching a wave in water teeming with a sludge of microorganisms, the glowing ocean offers the chance of a lifetime. Night swimmers also often delight in the opportunity to lounge in a bioluminescent sea. The organisms can also be present in wet beach sand, so even beach walkers can watch as the ground sparkles with every footstep. Several videos posted on YouTube show the majestic effects of the phenomenon. Watch below as a surfer sets a wave aflame. Sweet post! I wish I was there to see the blue waves in person. Its crazy how mother nature works.